Chilli Pepper Penguins: (Owner/Captain/Leader: Captain Chilli Pepper, that's me! ), Bobcoffee7, Reeze, Nms 30, Kincaid7, Double MVP, + Henry515! Always room for more! Funny Pictures and Membership Giveaway! Club Penguin Advertises on Gamin Website, NinjaKiwi! Attention All EPF Agents: New Message From Agent G! Club Penguin Field-Ops Weekly Mission Guide! Club Penguin's Elite Penguin Force Nintendo D.S Game Mission Cheats! Club Penguin’s Elite Penguin Force Nintendo D.S Game Mission Cheats! History of the Spicy Squad! 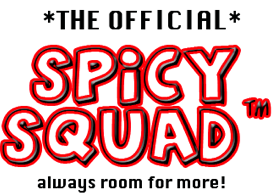 Join the Spicy Squad Here! Exclusive Play: Underwater Adventure Play Cheats, Info, and Costume Trunk Hidden Items 2009! Hello Penguins! This is an amazing play! This is probably one of the plays that everyone really gets excited for becasue it is announced after a hit party! Everyone is curious and everyone wants to know what it is about! When two normal penguins dive into the ocean, they approach some cool traveling experiences. Once both penguins ponder upon a mystic fish, there journey turns into something like never before! THERE ARE NO CLOTHING HIDDEN ITEMS! 😦 BUT CHECK OUT THESE TIPS! 1. Check out the new clothes. 2. There are some rare items which are: mermaid costume, blue flippers, blue snorkel, yellow flippers, and black scuba mask. 3. Receive the new play background! Wait, so there are no hidden items in there? Hey dude! I am a big fan of ur website. 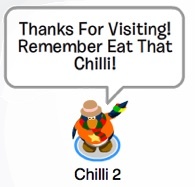 Is there anyway i can be apart of ur awesomely awesome “Official Chili Pepper Penguins Group?” The reason why i want to become apart of that is i love club penguin and i hate fish and guess what the only thing i eat on club penguin is chili just like you! If i can be apart of this email me at Removed by Editor Thanx! Sadly, yes you are right, there are no hidden items in there. 😦 Look at my cool tips though. My penguin doesn’t like fish. He likes PIZZA!! Editor’s Note: They sold the caramel apple last year. They might bring it back this year since there are signs saying More Prizes to Come. No lol. You are not being mean. Lol I forgot to fix it OOPS. Better fix that right now! New Furniture Exclusive: August and September 2009 Better Igloos Furniture Catalog Cheats! New Igloo Upgrades Catalog Cheats! Igloos! Hello Penguins! The new Better Igloos catalog is here! Finally after waiting so long after the Festival of Flight! These are some sweet hidden items and furniture! 1. If you click on the stove panel, you can get the Bowling Pin! 2. If you click on the stove buttons, you can get the fridge! 3. If you click on the corner of the cabinet, you can get the Bowling Alley! 4. If you click on the Gramophone, you can get the Band Stage! 5. If you click on the scratch tables, you can get the wall speakers! 6. If you click on the column, you can get the Guitar Stand! 7. If you click on the Bamboo Torch, you can get the LCD TV! 8. 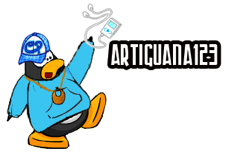 Last, if you click on the Medieval Banner, you can get the Medieval Penguin Ice Sculpture! Enjoy the new cheats fellow penguins! Now on for the Igloo Upgrades! 1. There is new floor carpets for everyone to enjoy! A Blue Polka Dot Floor and Painted Dance Steps! Sweet! All the Club Penguin users now have new igloo items to enjoy! Sweet cheats! These cheats are awesome! Go get them! nice and very informative writeup keep it up. Reviewed by You Once Again! I would write about a mermaid that is looking for lost treasure and meets a fish and a squid who join her along the way. Then when they find the treasure chest they open it up and it is just filled with chocolate coins. The mermaid, the squid, and the fish learn the treasure that counts is friendship, and the story would end by the three friends eating the chocolate coins! Congrats, Blackie487! Happy77 would really like that story… Club Penguin hopes everyone will like the brand new Underwater Adventure play on Friday. In addition: There’s a new Snow and Sport catalog being released coming up. Happy77 Talks New Play! Underwater Adventure! A sneak peek! What inspired you about doing the costumes? Tell us something cool about the set! There’s an entire sea castle to climb in! And a secret shadowy sea creature in the distance. For this play, are there treats underwater? Well, chocolate bars tend to get a little soggy, and cotton candy is a mess…we could have tried sea salt taffy – but I’m pretty sure we didn’t. Remember it comes on Friday! Get ready to explore! P.S Go on Club Penguin while the Festival of Flight is still here! New plays rock! It sure gets everyone excited around the island! I can’t wait for the new Costume Trunk Catalog! YOYO Ronne15!!! ROFL! Thanks dude! Sneak Peeks rock yo! I’m pretty disappointed. I’m getting low hits, low comments – Nearly No comments per day 😦 . Would you like to help me? Is this same happening with you? Ok, if you comment on quite times and just try to visit everyday, I’ll do nearly the same! I’ll visit ur site everyday! I hope you visit and comment on everyday if you come online! Hey Ayustj, I would like to see your site and comment! Does it have a name? Club Penguin's New Newspaper Issue #201 Upcoming Events and Info! Festival of Flight Finished According to News! We are on water again? There is a new newspaper on Club Penguin! Wow, does everyone still remember the #200 issue? That newspaper was jammed with events! Tons of parties and stuff wow! Hopefully this newspaper isn’t too complex for everyone! But hey, doesn’t everyone like tons of new things to come to Club Penguin? Well let’s get back on topic here. Heehee. Finally a new Sports Catalog is coming! WOW! Did I hear news about a new pin! Check out the date below! Never tried clicking the classified file? Well here’s some classified news. Shhh!! Tired of your old furniture? August 21st will give you some new surprises! YES! We can finally see a closer look on this new play that is coming up! The Underwater Adventure is soon to rise up to sea! I’m afraid to go to the coastline now, I don’t want to fall off Club Penguin. lol. Wow! Thanks Club Penguin! I know this party was a hit! Too bad it is going to end soon! That’s all for now penguins! Enjoy the news! Ahh, I Love to read! Cmon Penguins! Read this new newspaper! It’s awesome! Club Penguin’s New Newspaper Issue #201 Upcoming Events and Info! Festival of Flight Finished According to News! We are on water again? Festival of Flight Party Extended! The Festival of Flight party has been a hit on Club Penguin. In my opinion, it’s probably one of the best parties of all time. So.. Club Penguin is being really nice! They are extending the party until August 20 instead of the 18th! Sweet!! Keep flying those jet packs and green propellors! But don’t forget about the play, Underwater Adventure that is going to start on August 21 at the Stage!! Did someone say Lobster Claws? In Addition: My 1 Year Serving You party is coming up soon on August 29th! I’m so excited for it! How about you? Click here for more info. Since the party is longer, that means more penguins have the chance to find Gary! If you would like to find Gary look at my 100% Accurate Gary the Gadget Guy Tracker! I’m lovin’ this party! How about you? Comment your thoughts! I love this party too! This party will be one of the biggest, and best parties you will ever come to. You don’t want to miss it! Chat with up to 50 other penguins, play games, get your player card featured, pose for party pics, and party! I will add everyone! I hope to see you at this HUGE party!